(Nanowerk News) Rice University bioengineering researchers have modified a commercial-grade CO2 laser cutter to create OpenSLS, an open-source, selective laser sintering platform that can print intricate 3-D objects from powdered plastics and biomaterials. The system costs at least 40 times less than its commercial counterparts and allows researchers to work with their own specialized powdered materials. The design specs and performance of Rice's OpenSLS platform, an open-source device similar to commercially available selective laser sintering (SLS) platforms, are described in an open-access paper published in PLOS ONE ("Open-Source Selective Laser Sintering (OpenSLS) of Nylon and Biocompatible Polycaprolactone"). OpenSLS, which was built using low-cost, open-source microcontrollers, cost less than $10,000 to build; commercial SLS platforms typically start around $400,000 and can cost up to $1 million. "SLS technology has been around for more than 20 years, and it's one of the only technologies for 3-D printing that has the ability to form objects with dramatic overhangs and bifurcations," said study co-author Jordan Miller, an assistant professor of bioengineering at Rice who specializes in using 3-D printing for tissue engineering and regenerative medicine. "SLS technology is perfect for creating some of the complex shapes we use in our work, like the vascular networks of the liver and other organs." He said commercial SLS machines generally don't allow users to fabricate objects with their own powdered materials, which is something that's particularly important for researchers who want to experiment with biomaterials for regenerative medicine and other biomedical applications. "Designing our own laser-sintering machine means there's no company-mandated limit to the types of biomaterials we can experiment with for regenerative medicine research," said study co-author Ian Kinstlinger, a graduate student in Miller's group who designed several of the hardware and software modifications for OpenSLS. 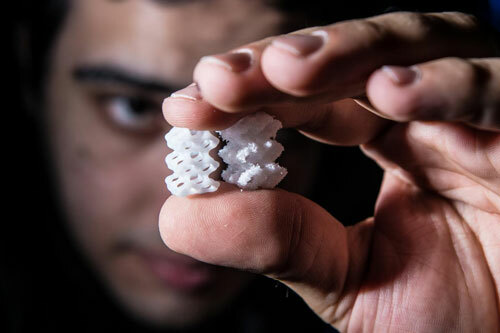 The team showed that the machine could print a series of intricate objects from both nylon powder -- a commonly used material for high-resolution 3-D sintering -- and from polycaprolactone, or PCL, a nontoxic polymer that's commonly used to make templates for studies on engineered bone. "In terms of price, OpenSLS brings this technology within the reach of most labs, and our goal from the outset has been to do this in a way that makes it easy for other people to reproduce our work and help the field standardize on equipment and best practices," Kinstlinger said. "We've open-sourced all the hardware designs and software modifications and shared them via Github." OpenSLS works differently than most traditional extrusion-based 3-D printers, which create objects by squeezing melted plastic through a needle as they trace out two-dimensional patterns. Three-dimensional objects are then built up from successive 2-D layers. In contrast, the SLS laser shines down onto a flat bed of plastic powder. Wherever the laser touches powder, it melts or sinters the powder at the laser's focal point to form a small volume of solid material. By tracing the laser in two dimensions, the printer can fabricate a single layer of the final part. "The process is a bit like finishing a creme brulee, when a chef sprinkles out a layer of powdered sugar and then heats the surface with a torch to melt powder grains together and form a solid layer," Miller said. "Here, we have powdered biomaterials, and our heat source is a focused laser beam." In SLS, after each layer is finished, a new layer of powder is laid down and the laser reactivates to trace the next layer. "Because the sintered object is fully supported in 3-D by powder, the technique gives us access to incredibly complex architectures that other 3-D printing techniques simply cannot produce," Miller said. Miller, an active participant in the open-source maker movement, first identified commercial CO2 laser cutters as prime candidates for a low-cost, versatile selective sintering machine in early 2013. Laser cutters are commonly used to make trophies, jewelry, toys, acrylic figurines and other commercial products. "The cutter's laser is already in the correct wavelength range -- around 10 micrometers -- and the machines come with hardware to control laser power and the x-axis and y-axis with high precision," Miller said. In the summer of 2013 Miller hosted a four-week crash course in hardware prototyping called the Advanced Manufacturing Research Institute, and AMRI participant Andreas Bastian, an artist and engineer, took on the challenge of creating the open-source SLS printer. He designed an integrated, high-precision z-axis and powder-handling system and fitted it with open-source, 3-D printer electronics from Ultimachine.com. Miller said Bastian even used the machine's laser-cutting features to produce many of the acrylic parts for the powder-handling system. "You can actually cut most of the required parts with the same laser cutter you are in the process of upgrading," Miller said. "It's around $2,000 in parts to build OpenSLS, and adding the parts to an existing laser cutter and calibrating the machine typically takes a couple of days." By the time Bastian left Rice in the fall of 2013, "we had demonstrated proof of concept," Miller said, "but a great deal of additional work still needed to be done to show that OpenSLS could be useful for bioengineering, and that is what Ian and the rest of the team accomplished." Miller said Kinstlinger's tests with PCL, a biocompatible plastic that can be used in medical implants for humans, were particularly important. "Biology in the body can take advantage of architectural complexity in 3-D parts, but different shapes and surfaces are useful under different circumstances," Miller said. For example, Kinstlinger said, the increased surface area found on rough surfaces and in interconnected pore structures are preferred in some situations, while other biological applications call for smooth surfaces. Kinstlinger addressed each possibility with PCL by developing an efficient way to smooth the rough surfaces of PCL objects that came out of the printer. He found that exposing the parts to solvent vapor for short time periods (around 5 minutes) provided a very smooth surface, due to surface-tension effects. In tests using human bone marrow stromal cells -- the type of adult stem cells that can differentiate to form bone, skin, blood vessels and other tissues -- Kinstlinger found that the vapor-smoothed PCL structures worked well as templates for engineered tissues that have some of the same properties as natural bone. "The stem cells stuck to the surface of the templates, survived, differentiated down a bone lineage and deposited calcium across the entire scaffold," he said. Miller said, "Our work demonstrates that OpenSLS provides the scientific community with an accessible platform for the study of laser sintering and the fabrication of complex geometries in diverse plastics and biomaterials. And it's another win for the open-source community."